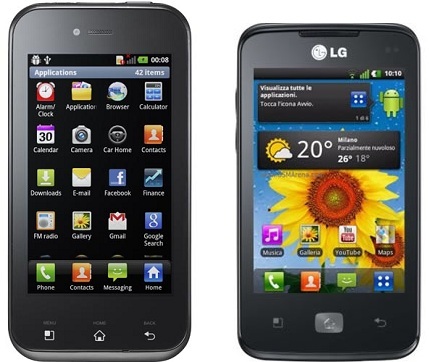 LG has today announced that two of its smartphones, the LG Optimus Sol and Optimus Hub are now available to Indian consumers officially. LG has price both the devices in the mid-price range segment thus directing competing with other devices in the same price range. The LG Optimus Sol is powered by a 1GHz processor and 512 MB RAM, runs on Android 2.3 Gingerbread OS, is 9.8mm thick and features a 3.8 inch “Ultra AMOLED” display and 5MP Camera. It has an internal storage of 1GB and is supported by a 1500 mAh battery. The Sol has been priced at Rs. 19000 by the company but is available for Rs. 16,990 at Flipkart. It competes directly with the likes such as Motorola Defy Plus which is now available at Rs. 15,990. On the other hand, the Optimus Hub powered by an 800 MHz processor and comes with 512 MB RAM. It is powered by Android 2.3.4 Gingerbread operating system and comes with a 3.5 inch HVGA LCD. The Optimus Hub has a 5 megapixel camera at the rear, GPS, Wi-Fi, Bluetooth 3.0 and 3G with 3.6Mbps HSDPA, 1500 mAh battery. LG has priced the Hub at Rs. 14,500 but it is available at Flipkart for Rs. 12,699.